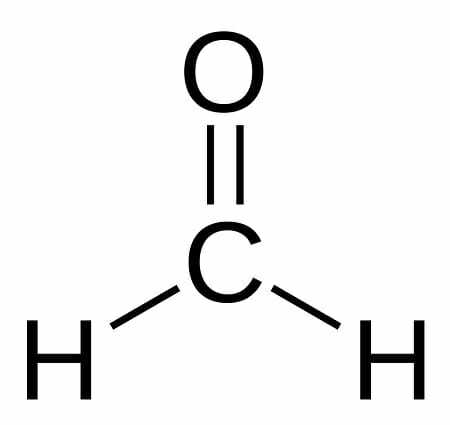 Formaldehyde is a simple organic compound with the formula CH2O. It is of interest to doctors and scientists, as well as to many other industries, because of its unique chemical properties. Formaldehyde is produced naturally by living things and some inorganic chemical reactions. It has been found via spectroscopy in interstellar space, and is produced in small quantities by our own bodies. However, like many of our body’s own waste products, it is toxic to us in high concentrations! Our bodies produce just enough formaldehyde to be handled safely by the liver and kidneys. Breathing formaldehyde fumes can cause lung and sinus irritation, sometimes severe. Long-term formaldehyde exposure is correlated to an increased risk of certain cancers. Ingesting formaldehyde (drinking it) can be fatal. However, as humans have found more and more uses for formaldehyde, we have begun artificially producing it in large quantities. The formaldehyde industry is booming due to the chemical’s vital role in industries such as car manufacture and the manufacture of building materials. It is thought that long-term exposure to formaldehyde may increase the risk of cancer, and many regulatory agencies enforce rules about the legally allowable amount of formaldehyde in living and workspaces. The European Union has banned some products that are made with, or contain, formaldehyde. Formaldehyde consists of one carbon atom that shares a double bond with an oxygen atom. The carbon’s remaining electron-sharing slots are occupied by two hydrogen atoms. The polar nature of its carbon-oxygen bond makes this a highly reactive compound. The oxygen atom attracts electrons more strongly than the carbon atom, resulting in a partial negative charge at one end of the compound and a partial positive charge at the other. This causes it to “stick” to other polar molecules and gives it some ability to accept and donate electrons. Its small molecular size enables it to penetrate tissues and other substances easily, while the polar nature of its carbon-oxygen bond makes it an excellent solvent. This ability to dissolve and react with many compounds is the reason it is used for many industrial and medical applications. In its pure state at room temperature, formaldehyde is a gas. It is most useful to science and industry in solution as a liquid. This is one reason why formaldehyde fumes are common where formaldehyde is used; it is quick to come out of solution and return to its gaseous state when exposed to air. Formaldehyde is often used in biology to preserve tissue specimens. Formaldehyde is useful for this purpose as it kills all bacteria and fungi, and can preserve the shape of a specimen by bonding with proteins and DNA. For the same reason, formaldehyde it is often used in embalming fluids intended to delay decay in human corpses, as well as in the preservation of animal specimens for dissection. Formaldehyde delays, but does not permanently prevent decay of tissue. For long-term preservation of samples, scientists must use processes like plasticization, which replace the specimen’s tissues with durable polymers. In today’s era of genomic analysis, scientists also sometimes prefer methods of tissue preservation that preserve nucleic acids. Formaldehyde does not preserve nucleic acids and so is not ideal for preserving tissue samples that will undergo DNA or RNA analysis. These often require special treatments to de-activate enzymes which break down DNA and RNA within cells. Used as an antiseptic, as it kills most bacteria and fungi. Used in the treatment of warts and some parasites. Used in the production and sterilization of some vaccines. A formaldehyde precursor is sometimes used as an alternative to antibiotics in the treatment of urinary tract infections. The kidneys turn this precursor into formaldehyde, which is then excreted into the urinary tract instead of circulating in the blood. Used in some personal hygiene products to prevent bacterial growth. Used as a reactant to produce many artificial materials such as resins, plastics, and other industrial chemicals. Used to treat clothes to make fabrics crease-resistant. Used to produce materials used in numerous parts of car manufacture. Used in the production of plywood, carpeting, and building insulation. Used in the production of sanitary paper products such as napkins, paper towels, and tissues. Used to make chemicals used in paints and explosives. Used to prevent bacterial and fungal growth in animal feed for commercial farming. Used in the development of some types of photography film. Unfortunately, the same properties of formaldehyde that make it an excellent solvent, antiseptic, and preservative can also make it dangerous to human health. It is toxic to the human body if ingested, and can cause irritation of the skin, lungs, and sinuses which can sometimes lead to long-term problems. The U.S. government lists formaldehyde as a “known carcinogen,” meaning it has is known to increase the risk of cancer with repeated exposure. People whose jobs require regular work with formaldehyde are recommended to use safety gear to limit exposure. Exposure to formaldehyde fumes may also make the development of asthma more likely, and can result in temporary or permanent sensitivity of the sinus passages and skin. In the United States, buildings are monitored to ensure that their air does not contain high levels of formaldehyde, which can sometimes be a risk for newly constructed buildings as formaldehyde is used in producing and finishing many building materials. The European Union has banned the import of some formaldehyde-containing and formaldehyde-treated products due to safety concerns. 1. Which of the following is NOT a risk of formaldehyde exposure? A. Long-term exposure can increase the risk of cancer. B. Ingesting formaldehyde can be fatal. C. Inhaling formaldehyde fumes for long periods of time can lead to asthma and other lung and sinus ailments. D is correct. Though our body produces minute amounts of formaldehyde as a natural cellular waste product, formaldehyde can quickly build to toxic concentrations and should never be ingested. Long-term exposure to formaldehyde fumes or skin contact can lead to cancer and other serious health problems. 2. Which of the following industries does NOT use formaldehyde? D is correct. All of the above industries use formaldehyde! 3. Which of the following is NOT a useful attribute of the formaldehyde molecule? A. Its carbon-oxygen bond is polar, allowing it to bond with and dissolve many substances. B. It is small, allowing it to penetrate other substances quickly and easily. C. It is a complex molecule with long, branching arms. C is correct. Formaldehyde is a simple molecule that certainly does not have branching arms. Its small size is part of the reason it is useful for industrial purposes. Haynes, W. M. (2014). CRC handbook of chemistry and physics. Boca Raton, FL: CRC Press.